The rapid explosion of the New Order's popularity and the skyrocketing number of Agents are both very good things. But with our rise come also the jackals. Fake "Agents" and fake "Saviours" will invariably pop up, hoping to profit from our good deeds. Socket Closed has made a name for himself--such as it is--by bumping miners who comply with the Code, and occasionally by impersonating an Agent of the New Order. How can you tell the difference between a fake "Agent" and the genuine article? It's simple. If they follow the Code, they are true Agents. Otherwise, they are not. Clearly, Jimmy 426 does not show proper respect for the Code. Do not be fooled! Jane 315 may bear a passing resemblance to the Saviour of Highsec, but is she a true Agent? It depends on whether she follows the Code or not. Judge by actions, not appearances. Our old friend, one of the False 315s, is at it again. Try as they might, our enemies can never replicate our success. There's no substitute for courage, honour, valour, integrity, honesty, and all those other things we represent so well! For shame! Clearly people don't understand the Code supercedes all else. The interesting thing about the miners is they say feel your ludicrously low 10m is too much. On both sides, both rebel and Code, it is the principle of the thing, not the price. This is what rebels know in their hearts, like Ms. Ice Slicer. She is prideful and arrogant, and will not bend her neck even to obvious superior force. On our side, we all know that submission to the code is necessary and good. But anyone can say he is following it. To a prideful and greedy miner, requiring even a token price separates the sheep from the goats. False prophets will always rise up. But even more, the greedy and violent. Now that you have shown the way (bumping), I see nothing to stop almost any greedy player from exploiting miners. Tomorrow I could occupy an ice field and charge 1m per day, and I expect get it from many miners, once I made it clear that I had the power to prevent their profit. After all that is just a fraction of their hourly profit. What stops me from doing this? Nothing except the Code. That is another reason why the Code is good for miners. The miners should thank their lucky ice chunks that instead of a criminal realizing the potential of bumping, that this discovery was instead made by a holy man. Perhaps this is providence working in mysterious ways. I disagree with that block of text. Perhaps you could say less. > The gankers are human. The miners are bots. The miners are quite literally less than human. They deserve to be wiped out, every last one of them. To the extent that they still feel anything, it should only be fear, humiliation, and misery. And that's not my opinion, mind you, it's just plain common sense and logic. No one can argue with it. The irony here is huge. Most of these faux agents are doing this with the aim of harming the new order in some way, and helping miners. They haven't thought it through though. If they fail to make any impact, then they fail. If they succeed in collecting significant tolls and impacting the community, then they prove that the miner ecosystem can successfully support copycats as well as the one legitimate New Order. While these foolish, misguided copycats will fail in their aims, they can't help but benefit the New Order. These are the kind of people who in real life would fight crime by dressing up as criminals and committing crimes. That never happens in real life, because these people get locked up in mental institutions if they go outside very often. Poor souls. What they're doing in EVE is different..they're dressing up as cops and trying to enforce the laws as if they were real agents. I appreciate the comic relief, but I still feel bad that they are so misguided. Whatever these faux Agents do, the New Order can only claim victory. 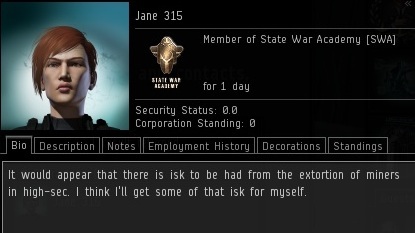 By putting down their mining lasers and taking the effort to create a faux Agent, these miners have taken the first step to unchaining themselves from ISK. For once, these miners are experiencing EVE gameplay - already, the New Order has won. Agreed, it's sad really, how the have to imitate someone else to try to capitalize on something they don't truly understand. But atleast they aren't afk or botting I suppose.